Written by Travel Excellence On October 31st, Halloween is celebrated in the United States of America. Nevertheless, in Costa Rica, at Cartago city, there’s a celebration in which masks, music, and other activities are turn into a tremendous celebration called Masquerade. 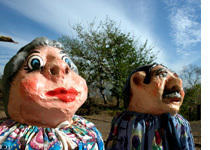 Part of Costa Rica culture , in which people take different customs and disguise as several political figures and traditional characters. Popular representatives of these are The Female Giant, The Devil, and Death. They all take a walk around Cartago city streets, accompanied by musicians, bands, and different marching crowds. This parade is one the things to do in Costa Rica , a celebration where you revive Costa Rica history . But, if you mix this party with any of the adventure tours in Costa Rica , you’ll be thrill by its beautiful surroundings and nature. And what can you expect from a masquerade? Well, simple, lots of dancing, national music, fascination, and creative masks designs. And one of the most attractive characteristics of this event is the fact that people can take their whole families and spend a nice time together, remembering old Costa Rica stories, traditions, legends and so on. Even though it was a rainy cold night, representing this season Costa Rica weather , it didn’t stop people from assisting to the colorful masquerade. Either if you were a character, musician, or a spectator, child, or even a grandpa. The activity is full of amazing images of dancing masks, moving melodies, and a big charisma. It paints every year Cartago city, making unforgettable memories in children minds as well as in grownups. Coloring Cartago streets and enriching Costa Rica culture . Due to its quality, people love assisting and will keep doing it because it makes them happy and relaxes them. By watching so many figures and enjoying an embracing entertainment. This can definitely be a last minute travel deals Costa Rica .